Like many days, March 3 saw the delivery of a stern opinion by President Obama. To judge by recent developments in Ukraine, he said, Russia was putting itself“on the wrong side of history.” This might seem a surprising thing for an American president to say. The fate of Soviet Communism taught many people to be wary of invoking History as if it were one’s special friend or teammate. But Obama doubtless felt comfortable because he was quoting himself. “To those who cling to power through corruption and deceit and the silencing of dissent,” he said in his 2009 inaugural address, “know that you are on the wrong side of history, but that we will extend a hand if you are willing to unclench your fist.” In January 2009 and again in March 2014, Obama was speaking to the world as its uncrowned leader. For some time now, observers—a surprisingly wide range of them—have been saying that Barack Obama seems more like a king than a president. Leave aside the fanatics who think he is a “tyrant” of unparalleled powers and malignant purpose. Notions of that sort come easily to those who look for them; they are predigested and can safely be dismissed. But the germ of a similar conclusion may be found in a perception shared by many others. Obama, it is said, takes himself to be something like a benevolent monarch—a king in a mixed constitutional system, where the duties of the crown are largely ceremonial. He sees himself, in short, as the holder of a dignified office to whom Americans and others may feel naturally attuned. A large portion of his experience of the presidency should have discouraged that idea. 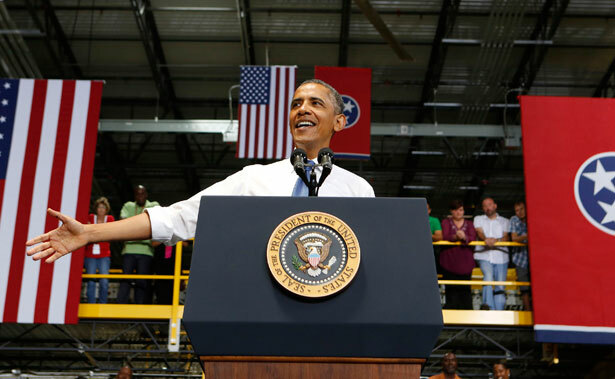 Obama’s approval ratings for several months have been hovering just above 40 percent. But whatever people may actually think of him, the evidence suggests that this has indeed been his vision of the presidential office—or rather, his idea of his function as a holder of that office. It is a subtle and powerful fantasy, and it has evidently driven his demeanor and actions, as far as reality permitted, for most of his five years in office. This pattern—the ascent to become presider-in-chief over large projects without any encumbering record of commitments—followed Obama into a short and uneventful legal career, from which no remarkable brief has ever been cited. In an adjacent career as a professor of constitutional law, he was well liked again, though his views on the most important constitutional questions were never clear to his students. The same was true of his service as a four-term Illinois state senator, during which he cast a remarkable number of votes in the noncommittal category of “present” rather than “yea” or “nay.” Finally, the same pattern held during his service in the US Senate, where, from his first days on the floor, he was observed to be restless for a kind of distinction and power normally denied to a junior senator. Extreme caution marked all of Obama’s early actions in public life. Rare departures from this progress-without-a-trail—such as his pledge to filibuster granting immunity to the giants of the telecommunications industry in order to expose them to possible prosecution for warrantless surveillance—appear in retrospect wholly tactical. The law journal editor without a published article, the lawyer without a well-known case to his credit, the law professor whose learning was agreeably presented without a distinctive sense of his position on the large issues, the state senator with a minimal record of yes or no votes, and the US senator who between 2005 and 2008 refrained from committing himself as the author of a single piece of significant legislation: this was the candidate who became president in January 2009. Many of these facts were rehearsed in the 2008 primaries by Hillary Clinton. More was said by the Republicans in the general election. Yet the accusations were thrown onto a combustible pile of so much rubbish—so much that was violent, racist and untrue, and spoken by persons manifestly compromised or unbalanced—that the likely inference was tempting to ignore. One could hope that, whatever the gaps in his record, they would not matter greatly once Obama reached the presidency. His performance in the campaign indicated that he had a coherent mind, did not appeal to the baser passions, and was a fluent synthesizer of other people’s facts and opinions. He commanded a mellow baritone whose effects he enjoyed watching only a little too much, and he addressed Americans in just the way a dignified and yet passionate president might address us. The contrast with George W. Bush could not have been sharper. And the decisiveness of that contrast was the largest false clue to the political character of Obama. He was elected to govern when little was known about his approach to the practical business of leading people. The unexplored possibility was, of course, that little was known because there was not much to know. Of the Chicago organizers trained in Saul Alinsky’s methods of community agitation, he had been considered among the most averse to conflict. Incongruously, as Jeffrey Stout has pointed out in Blessed Are the Organized, Obama shunned “polarization” as a valuable weapon of the weak. His tendency, instead, was to begin a protest by depolarizing. His goal was always to bring the most powerful interests to the table. This should not be dismissed as a temperamental anomaly, for temperament may matter far more in politics than the promulgation of sound opinions. The significance of his theoretical expertise and practical distaste for confrontation would emerge in the salient event of his career as an organizer. The women, as it turned out, lacked the necessary skill. They taunted and teased the city official. One of them dangled the microphone in front of him, snatched it away and then repeated the trick. He walked out insulted and the meeting ended in chaos. And where was Obama? By his own account, he remained at the back of the room, waving his arms—too far away for anyone to read his signals. In recounting the incident, he says compassionately that the women blamed themselves even though the blame was not all theirs. He does not say that another kind of organizer, seeing things go so wrong, would have stepped forward and taken charge. “Leading from behind” was a motto coined by the Obama White House to describe the president’s posture of cooperation with NATO, when, after a long and characteristic hesitation, he took the advice of Hillary Clinton’s State Department against Robert Gates’s Defense Department and ordered the bombing of Libya. Something like that description had been formulated earlier by reporters covering his distant and self-protective negotiations with Congress in the progress of his healthcare law. When the phrase got picked up and used in unexpected ways, his handlers tried to withdraw it. Leading from behind, they insisted, did not reflect the president’s real attitude or the intensity of his engagement. By the terms of the 1973 War Powers Resolution, a president needs congressional approval before he can legally commit American armed forces in “hostilities” abroad. But according to the argument offered by Obama’s lawyers, hostilities were only hostilities if an American was killed; mere wars, on the other hand, the president can fight as he pleases—without the approval of Congress. No American soldier having been killed in Libya, it followed that Obama could lead the country from behind without congressional approval. This delicate legal sophistry served its temporary purpose and the bombing went forward. Yet the awkward description, “leading from behind,” would not go away. These days, the phrase is mostly used as a taunt by war-brokers whose idea of a true leader runs a remarkably narrow gamut from former president George W. Bush to Senator John McCain. These people would have no trouble with Obama if only he gave us more wars. It was clever of Obama to quote the gesture. At the same time, it was oddly irresponsible. After all, in the post–New Deal years, the union and civil rights movements had tremendous clout in America. They could make real noise. No such combination of movements existed in 2008. By the middle of 2009, Barack Obama was no longer listening. He had already picked an economic team from among the Wall Street protégés of the Goldman Sachs executive and former economic adviser to the Clinton administration, Robert Rubin. For such a team, job creation and environmental regulation were scarcely attractive ideas. When the new president chose healthcare as the first “big thing” he looked to achieve, and announced that, for the sake of bipartisan consensus, he was leaving the details of the legislation to five committees of Congress, his “I can’t hear you” had become a transparent absurdity. The movements had never been consulted. Yet Obama presumed an intimacy with their concerns and a reliance on their loyalty—as if a telepathic link with them persisted. There was a ludicrous moment in the late summer of 2009 when the president, in a message to followers of “Obama for America,” told us to be ready to knock on doors and light a fire under the campaign for healthcare reform. But what exactly were we to say when those doors opened? The law—still being hammered out in congressional committees in consultation with insurance lobbyists—had not yet reached his desk. In the end, Obama did ask for help from the movements, but it was too late. He had left them hanging while he himself waited for the single Republican vote that would make his “signature law” bipartisan. That vote never came. The proposal, the handoff to Congress and the final synthesis of the Affordable Care Act took up an astounding proportion of Obama’s first year in office. If one looks back at the rest of those early months, they contained large promises—the closing of Guantánamo being the earliest and the soonest to be shelved. The most seductive promise went by the generic name “transparency.” But Obama’s has turned out to be the most secretive administration since that of Richard Nixon; and in its discouragement of press freedom by the prosecution of whistleblowers, it has surpassed all of its predecessors combined. It was magical thinking, of course—that Americans would follow if only we heard him often enough; that people of the most divergent tempers and ideas would gradually come to approve of him so visibly that he could afford to show the country that he heard the call for reform. But one can see why his presidency was infused with such magical thinking from the start. His ascent to the Oval Office had itself been magical. To be known as the voice of the country, Obama believed, meant that he should be heard to speak on all subjects. This misconception, evident early, has never lost its hold on the Obama White House. The CBS reporter Mark Knoller crunched the first-term numbers, and some of them are staggering. Between January 2009 and January 2013 Obama visited forty-four states, led fifty-eight town hall meetings, granted 591 media interviews (including 104 on the major networks), and delivered 1,852 separate speeches, comments or scheduled public remarks. From all those planned interactions with the American public, remarkably few conversions ever materialized. Obama’s practice of recessive management to the point of neglect has also thrown up obstacles entirely of his devising. He chose to entrust the execution and “rollout” of his healthcare policy to the Department of Health and Human Services. That was an elective plan which he himself picked from all the alternatives. The extreme paucity of his meetings with his secretary of health and human services, Kathleen Sebelius, in the three years that elapsed between his signing of the law and the rollout of the policy makes a fair epitome of negligence. Indeed, the revelation of his lack of contact with Sebelius left an impression—which the recent provocative actions of the State Department in Ukraine have reinforced—that the president is not much interested in what the officials in his departments and agencies are up to. Obama entered the presidency at 47—an age at which people as a rule are pretty much what they are going to be. It is a piece of mystification to suppose that we have been denied a rescue that this man, under happier circumstances, would have been well equipped to perform. There have been a few genuine shocks: on domestic issues he has proven a more complacent technocrat than anyone could have imagined—a facet of his character that has emerged in his support for the foundation-driven testing regimen Race to the Top, with its reliance on outsourcing education to private firms and charter schools. But the truth is that Obama’s convictions were never strong. He did not find this out until his convictions were tested, and they were not tested until he became president. Perhaps the thin connection between Obama’s words and his actions does not support the use of the word “conviction” at all. Let us say instead that he mistook his preferences for convictions—and he can still be trusted to tell us what he would prefer to do. Review the record and it will show that his first statement on a given issue generally lays out what he would prefer. Later on, he resigns himself to supporting a lesser evil, which he tells us is temporary and necessary. The creation of a category of permanent prisoners in “this war we’re in” (which he declines to call “the war on terror”) was an early and characteristic instance. Such is Obama’s belief in the power and significance of his own words that, as he judges his own case, saying the right thing is a decent second-best to doing the right thing. More than most people, Obama has been a creature of his successive environments. He talked like Hyde Park when in Hyde Park. He talks like Citigroup when at the table with Citigroup. And in either milieu, he likes the company well enough and enjoys blending in. He has a horror of unsuccess. Hence, in part, his extraordinary aversion to the name, presence, or precedent of former president Jimmy Carter: the one politician of obvious distinction whom he has declined to consult on any matter. At some level, Obama must realize that Carter actually earned his Nobel Prize and was a hard-working leader of the country. Yet of all the living presidents, Carter is the one whom the political establishment wrote off long ago; and so it is Carter whom he must not touch. What, then, of Obama’s commitment in 2008 to make the fight against global warming a primary concern of his presidency? He has come to think American global dominance—helped by American capital investment in foreign countries, “democracy promotion,” secret missions by Special Operations forces, and the control of cyberspace and outer space—as the best state of things for the United States and for the world. We are, as he has told us often, the exceptional country. And time that is spent helping America to dominate the world is time that cannot be given to a cooperative venture like the fight against global warming. The Keystone XL pipeline, if it is built, will bring carbon-dense tar sands from Canada to the Gulf Coast, and probably Obama would prefer not to see the pipeline built. Yet it would be entirely in character for him to approve and justify its construction, whether in the name of temporary jobs, oil industry profits, trade relations with Canada or all of the above. He has already softened the appearance of surrender by a device that is in equal parts real and rhetorical. It is called the Climate Resilience Fund: a euphemism with all the Obama markings, since resilience is just another name for disaster relief. The hard judgment of posterity may be that in addressing the greatest threat of the age, Barack Obama taught America dimly, worked part-time at half-measures, was silent for years at a stretch and never tried to lead. His hope must be that his reiterated preference will count more heavily than his positive acts.